Home Fab Lab Connect Augmented Reality for Fab Education a Hit at #Fab14! Fab Lab Connect and School Fab Lab Co-founder, Nader Shaterian, was scheduled to run a workshop in the afternoon at Fab14, but Neil Gershenfeld asked him to show it this morning to another big group as well. 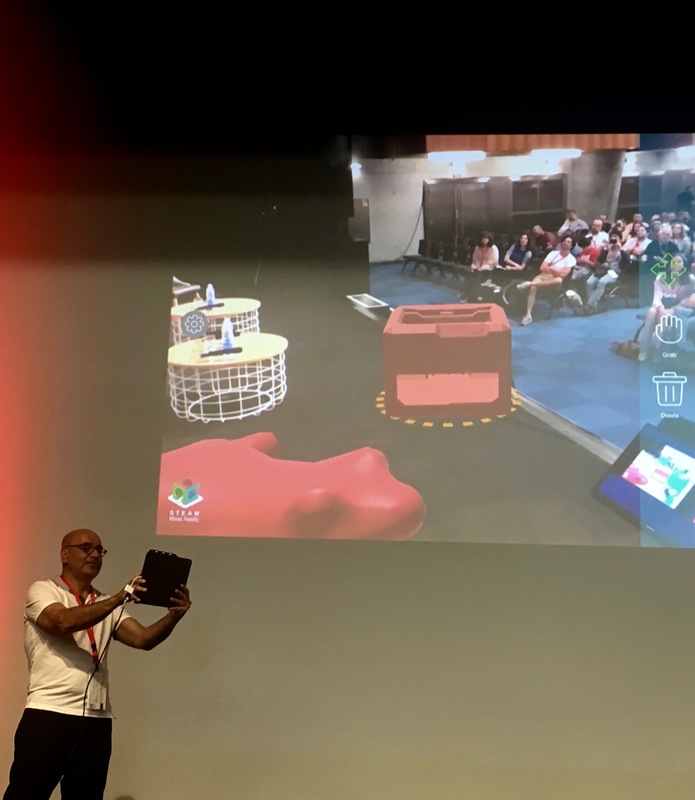 The presentation was titled “Augmented Reality for Fab Education” – highlighting a new app, the SFL AR App. The #SFLApp was created to support Fab education for schools. It’s a new medium for immersive learning. It offers access to learning for people who might never have access to machines, so they can experience technologies in a virtual way. Simone Amber, Fab Lab Connect’s Co-founder, reports: then professor Neil Gershenfeld jumped on stage, joining Nader, asking how people can get ahold of the app. Nader said the SFL AR App is now available on the Apple App Store. That got a round of applause! Nader said that School Fab Lab is planing to make the current app on the App Store free by September 2018, and will invite the Fab community to join the testing group for accessing future releases of the new apps. Nader demonstrated the second App which was also extremely well received. 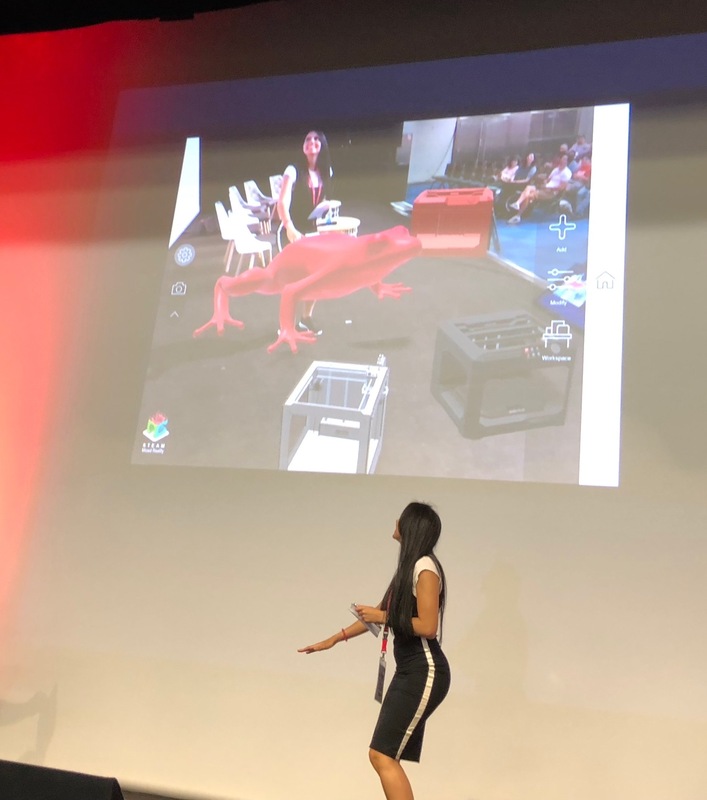 The mistress of ceremony came on stage spontaneously to interact with the red frog that Nader built into the App, and was projected on the large screen. Great applause again at the end. “The enthusiasm expressed by the amazing Fab network we love meant a great deal to us! !” shared Simone after the Workshop. 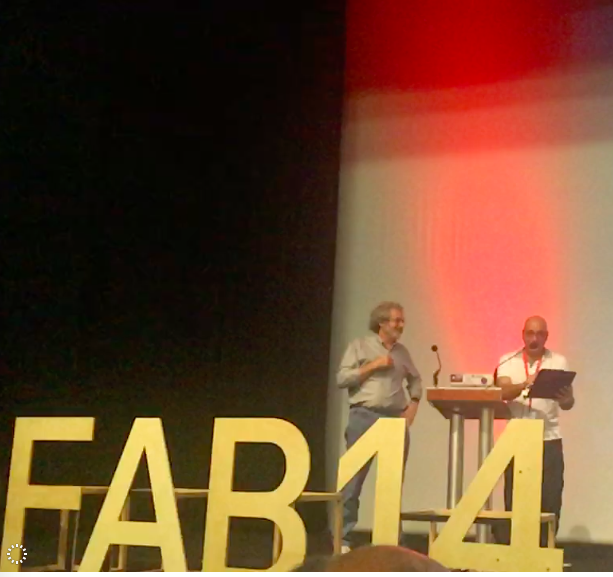 “Augmented Reality in Fab Education & School Fab Lab Mixed Reality” Afternoon Workshop, presented by Nader Shaterian. Educators and Fabbers can use the SFL AP App to experiment with placing machines, see them function in a customized space, then can record the mixed reality space and share it through video.